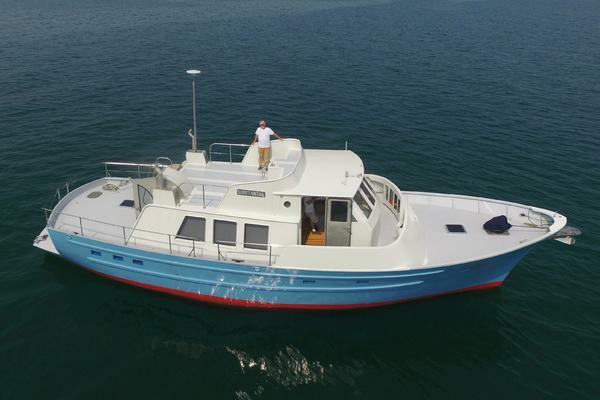 The Grand Banks 42 Classic essentially defined what has become a hugely successful category known as the classic trawler yacht. 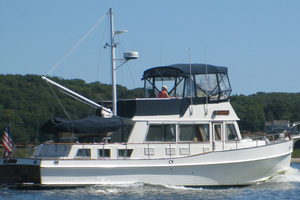 "RAMBLER" is hull no. 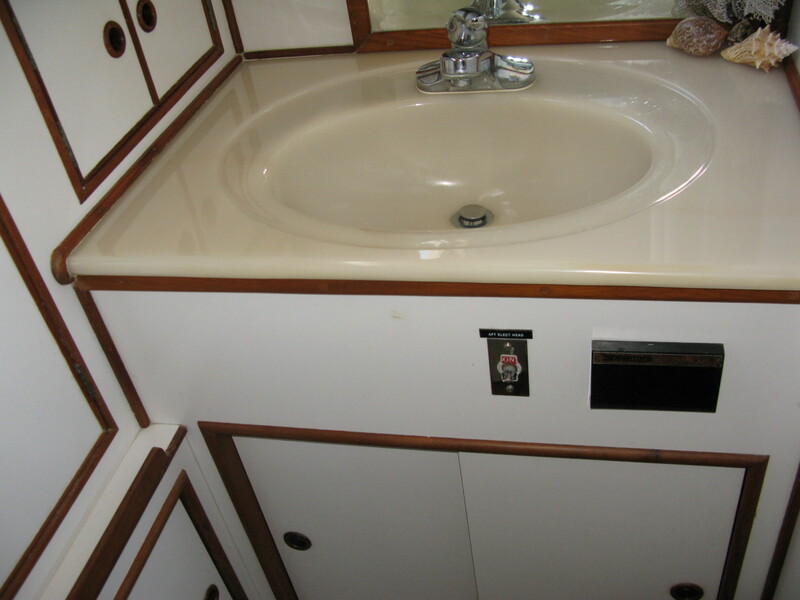 1316 of over 1,500 that were built beginning in the 1960's and uninterrupted over forty years through 2006. The yacht is built on the classic trawler layout with master cabin with en-suite head aft, salon, galley and helm amidships over the engine room and guest cabin with head forward. 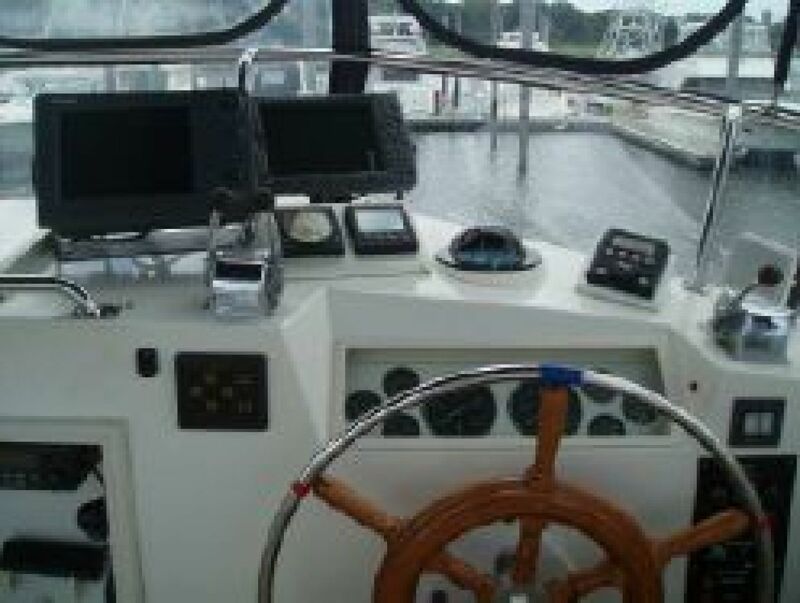 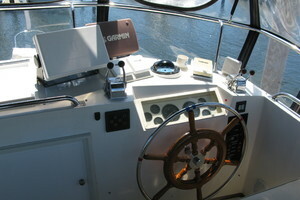 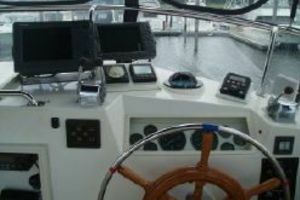 She offers lower helm station with Fly Bridge with helm station. She is built on a semi displacement hull which is easily driven for optimum economy and range yet capable of speeds in the upper teens when needed. 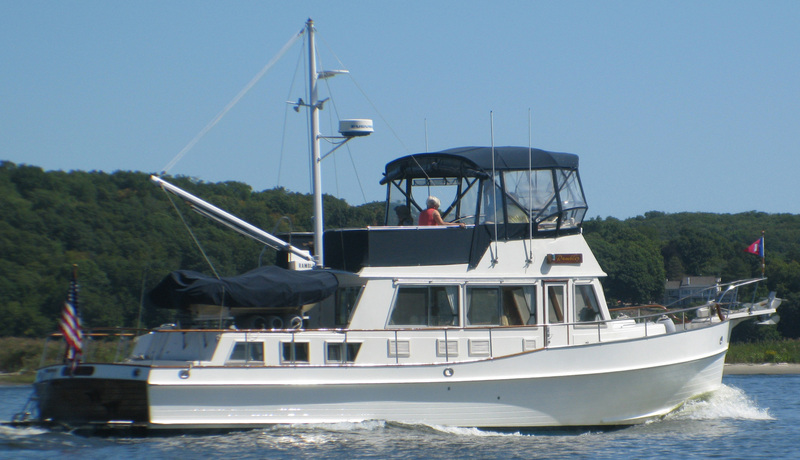 She is built on a beefy hand laid solid Fiberglass hull with coring in the hull and superstructure where applicable. 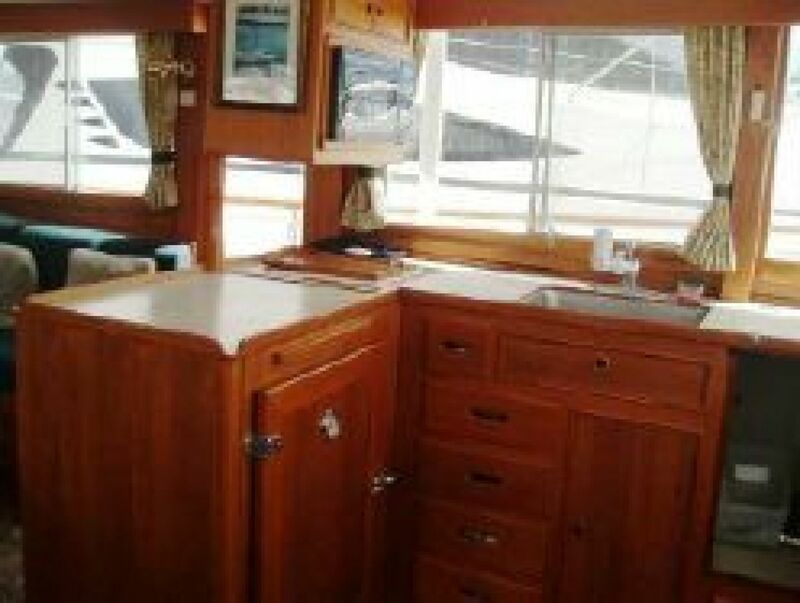 Grand Banks Singapore yard is known for top quality construction and engineering and perhaps the finest teak interior joinery available anywhere in the world. 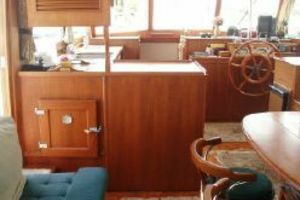 "RAMBLER" is seriously for sale, she's had just two owners and is professionally maintained by one of New England's leading yards. 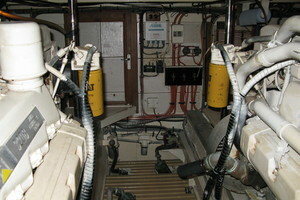 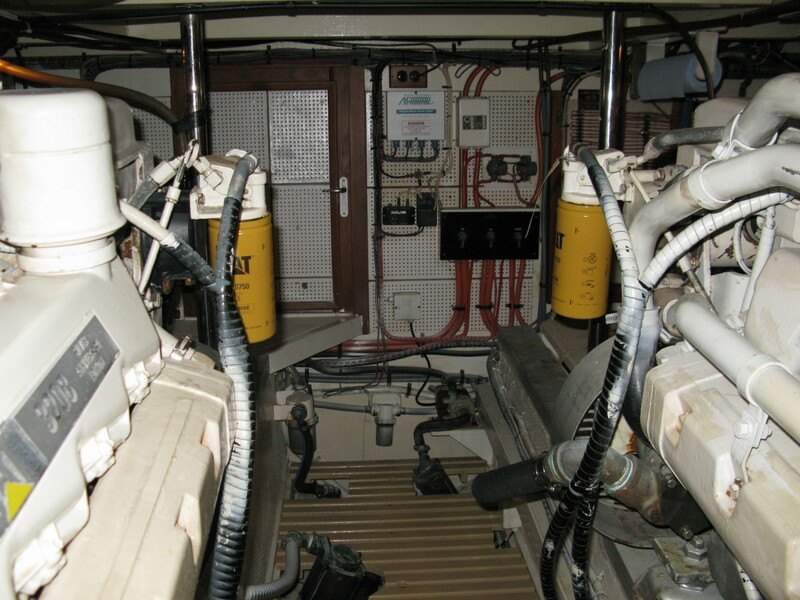 Recent "CAT" Engine Survey and Oil Samples available upon request. 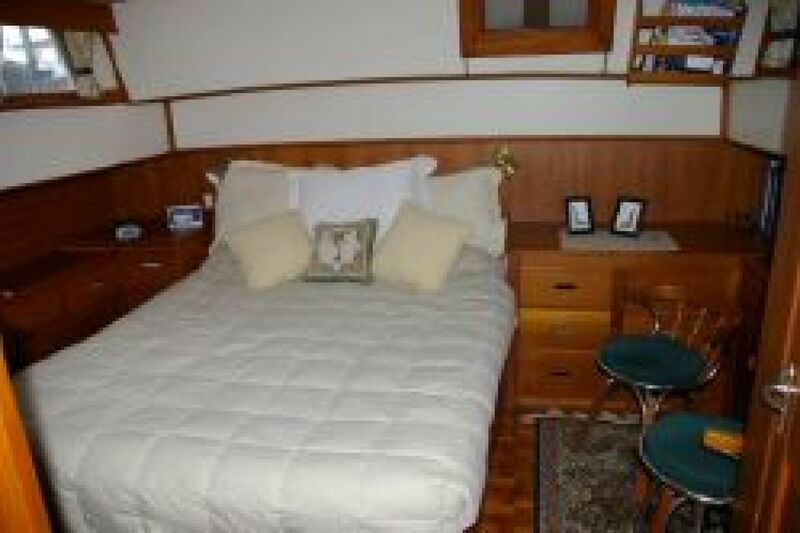 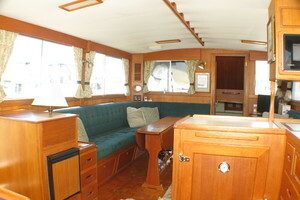 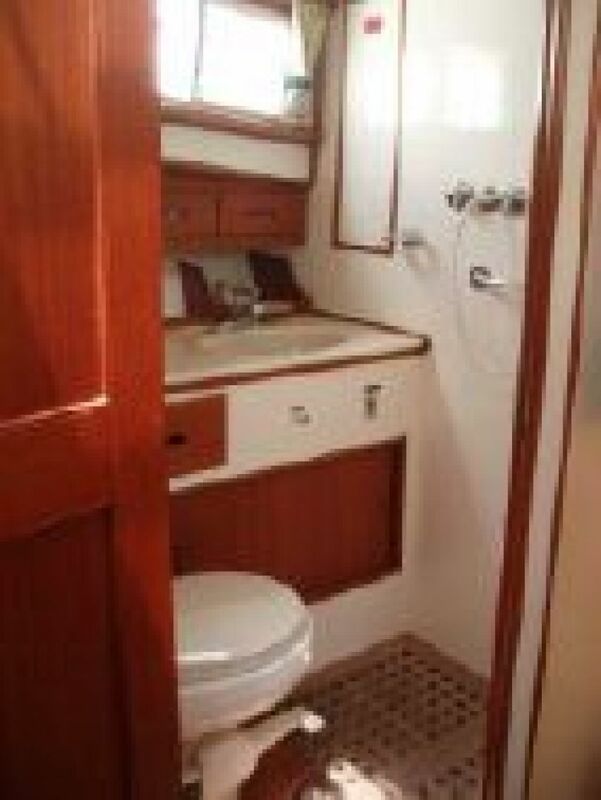 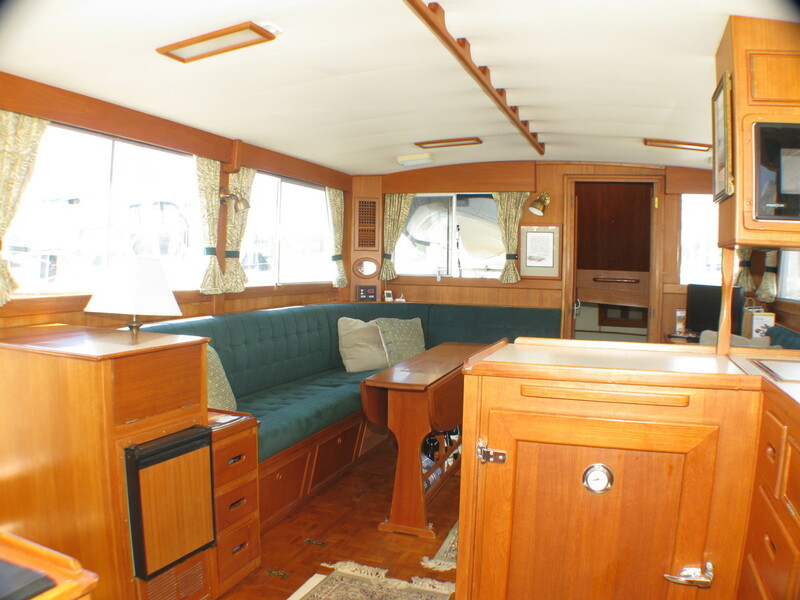 This GB42 Classic offers the most popular two stateroom, two head layout. 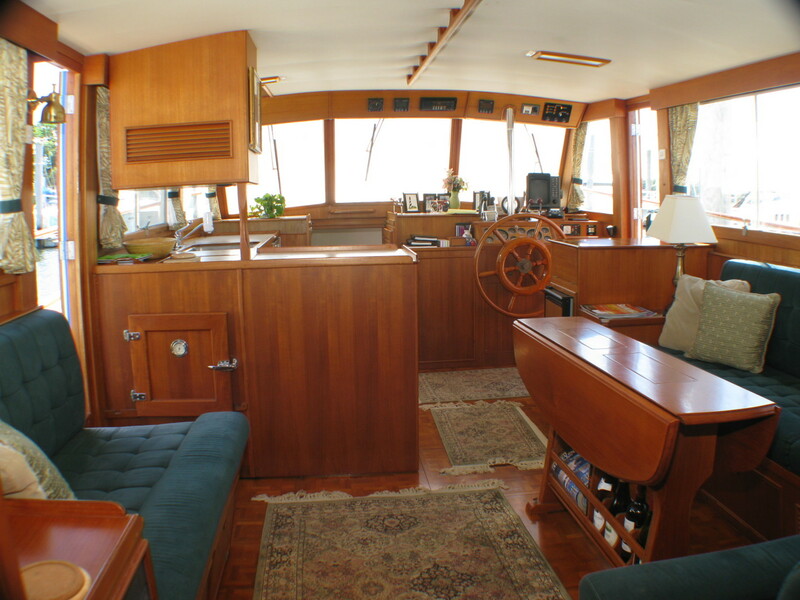 Upon entering the vessel from either port or starboard doors, you arrive on the main deck with galley on the port side and helm to starboard. 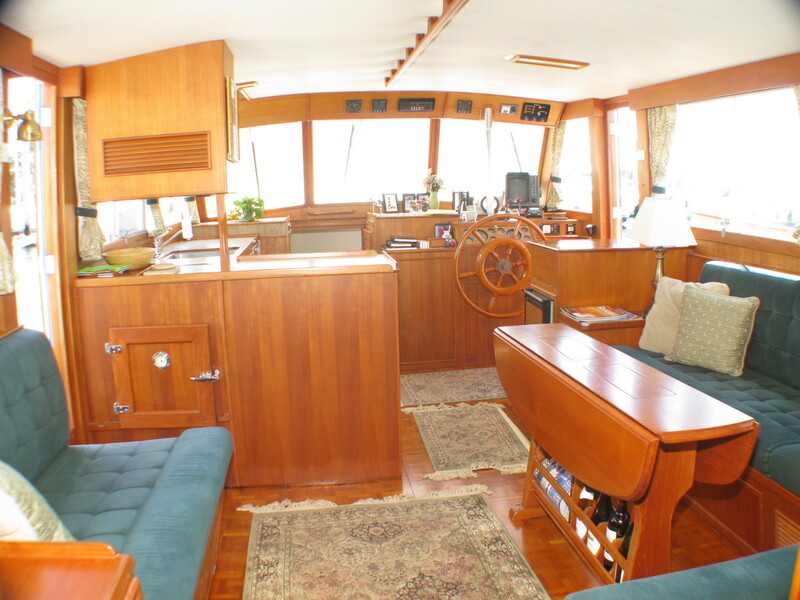 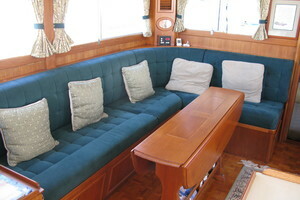 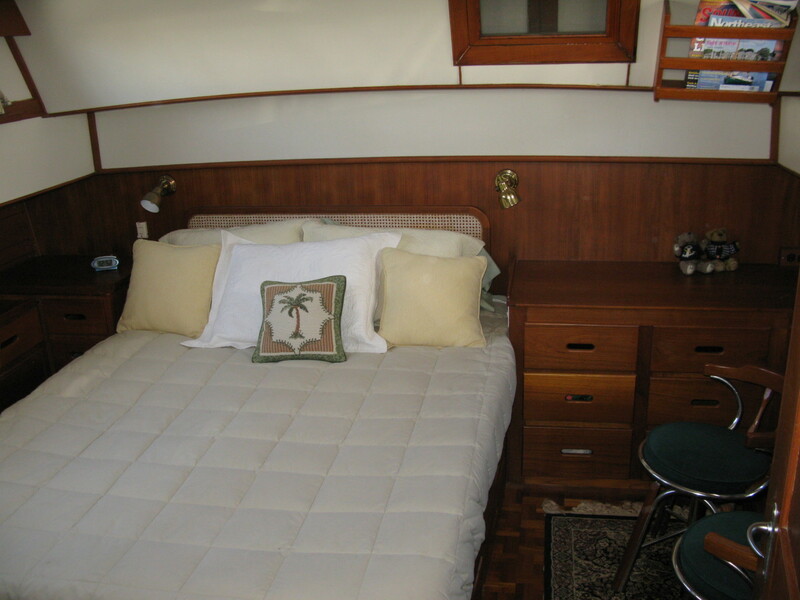 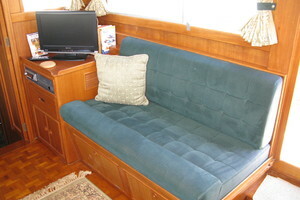 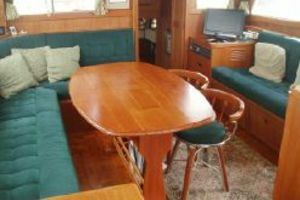 Aft of the helm on the starboard side is an L-shaped sofa with teak oval table with drop leafs and storage. 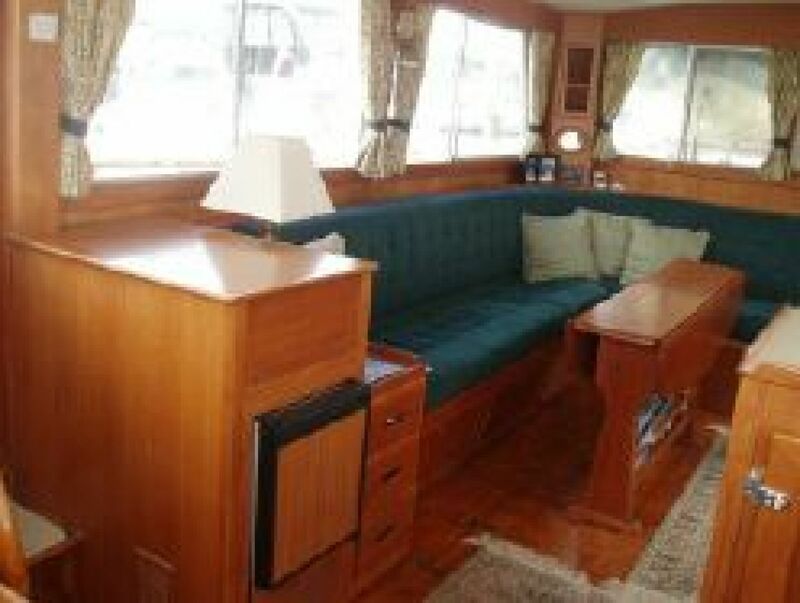 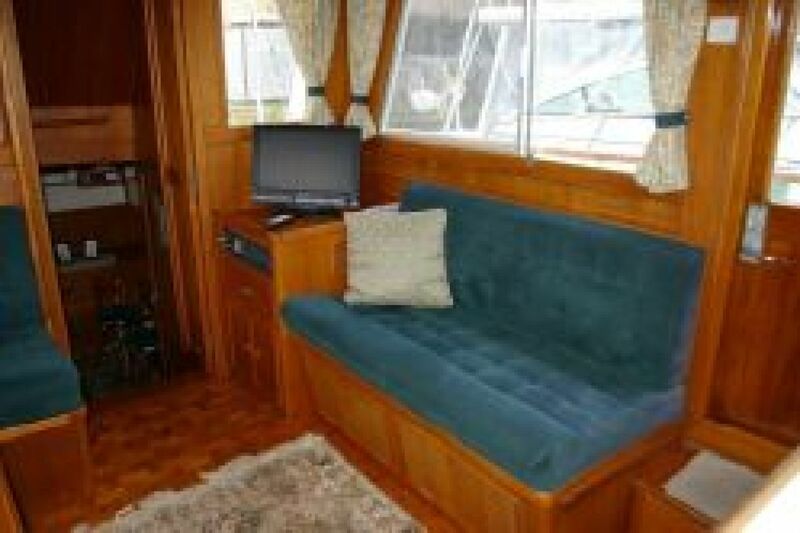 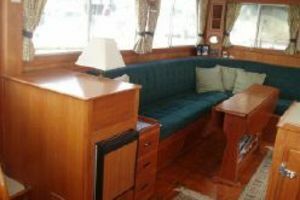 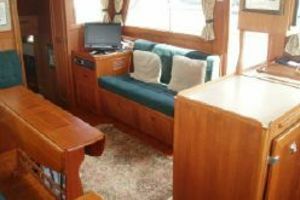 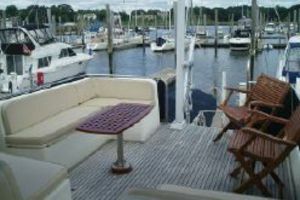 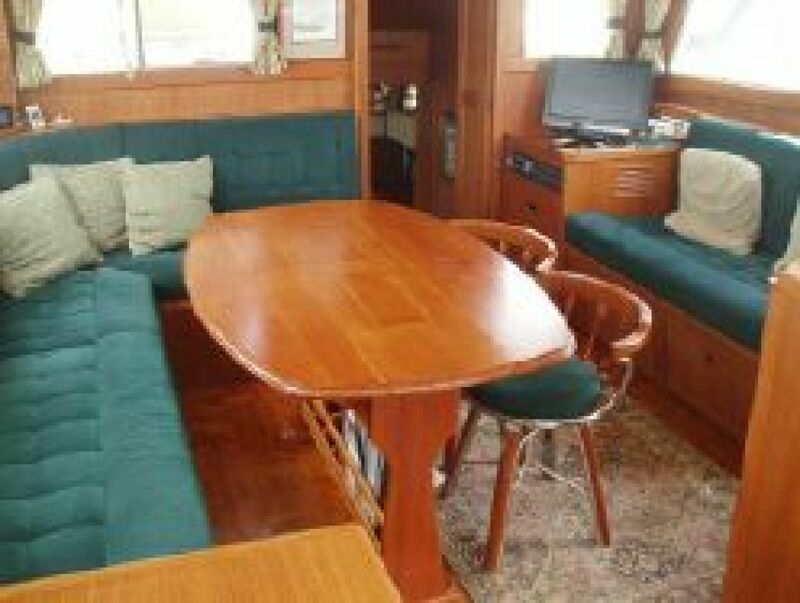 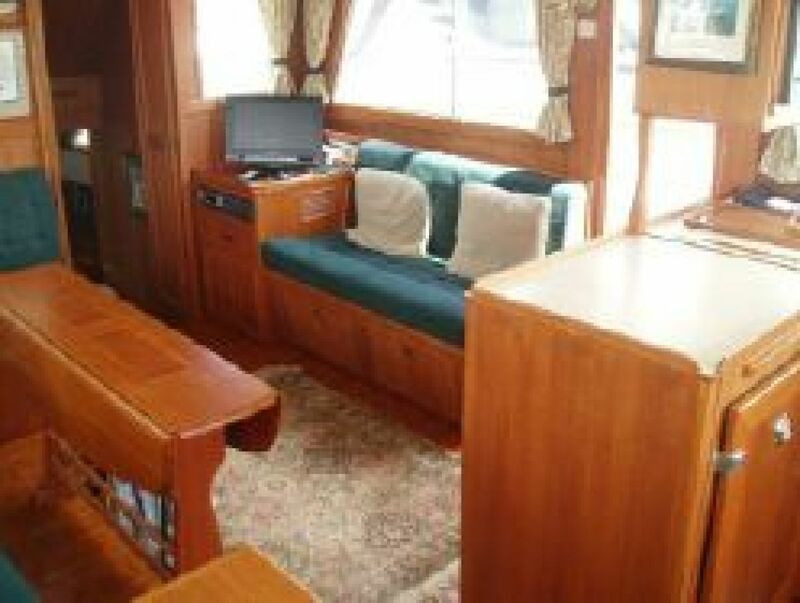 Across to port is the entertainment center with TV, DVD and Receiver and a double settee which converts to a single bunk. 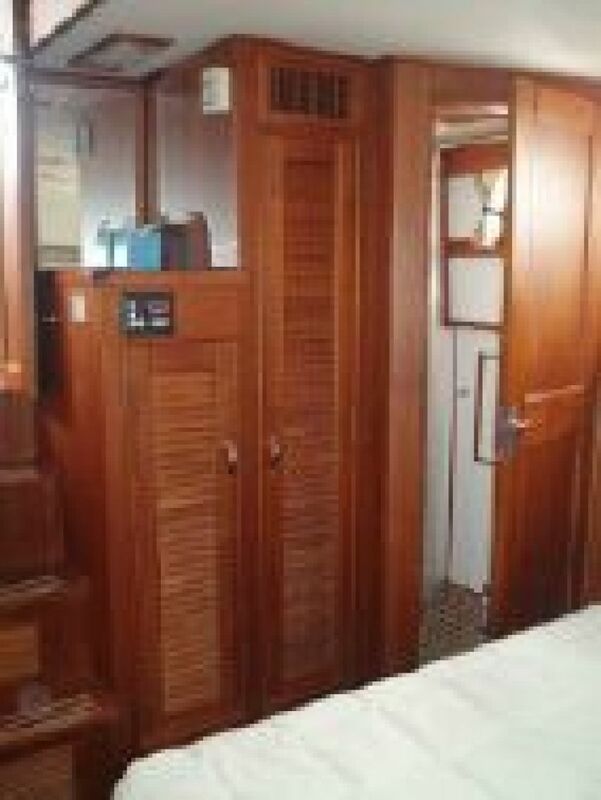 The master is down and aft and the guest stateroom is forward. 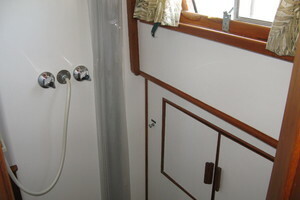 Each of the master and guest cabins have en-suite heads w/ showers. 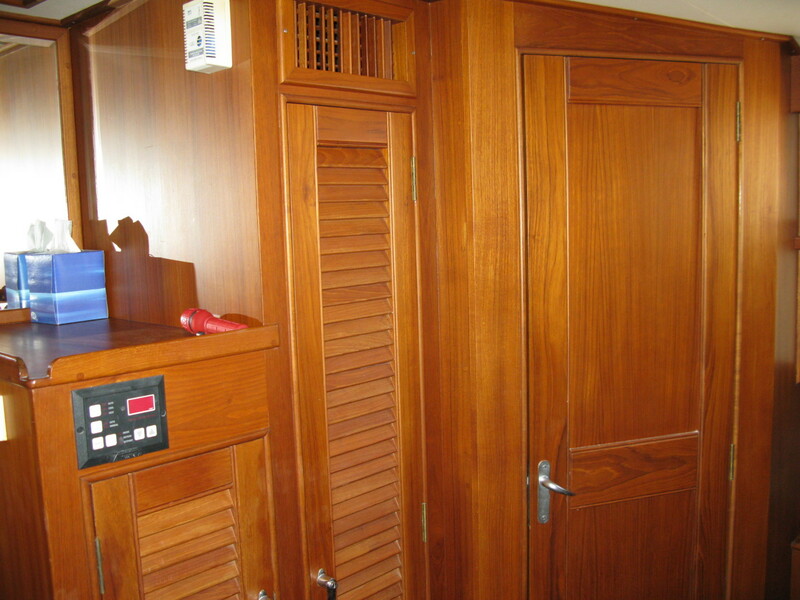 The salon is spacious and airy with excellent ventilation and visibility. 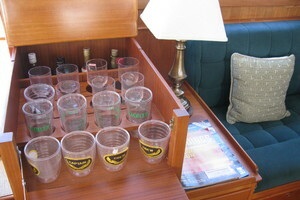 There is a bar with icemaker, glass and bottle storage. 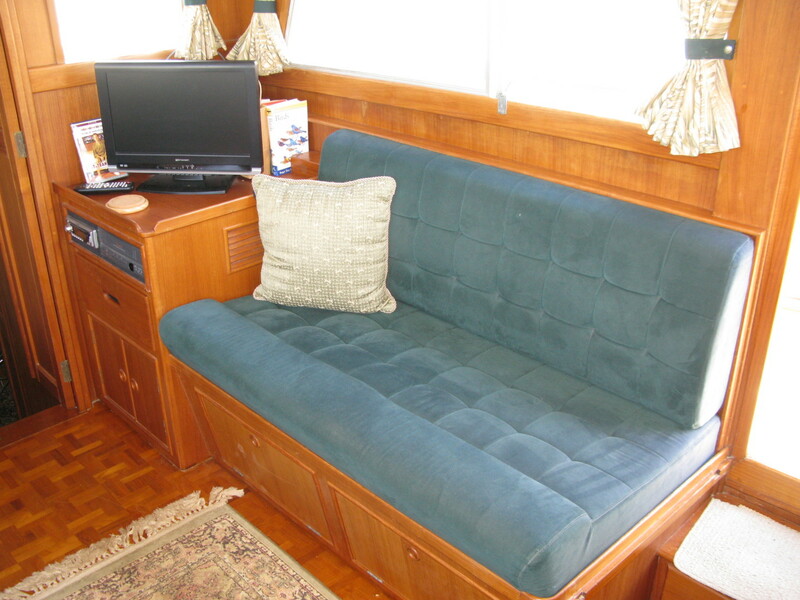 The decor is dark green Ultra Suede with classic GB beige curtains. 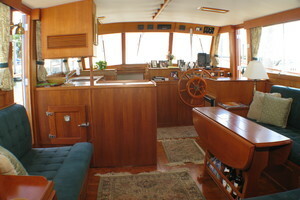 The interior is finished in varnished Teak joinery and parquet soles. 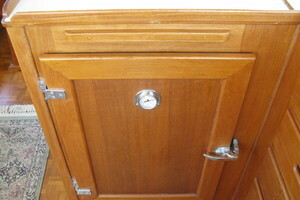 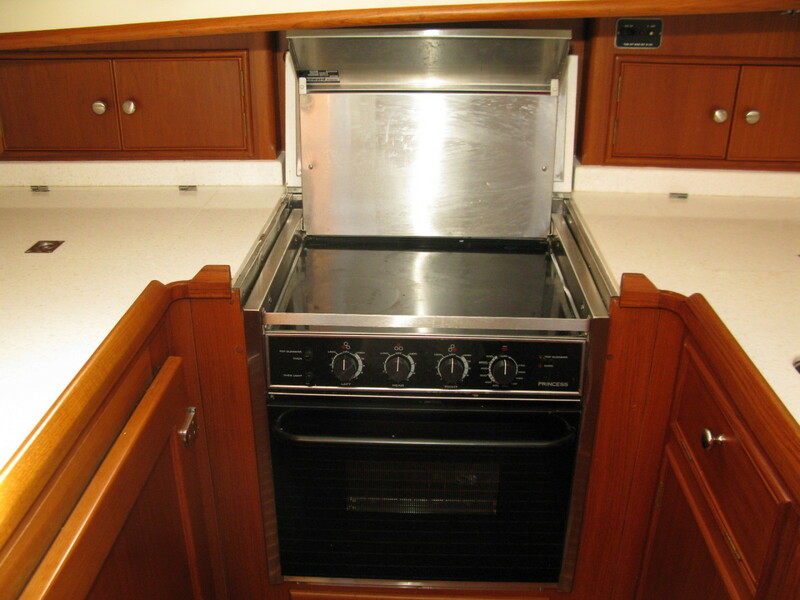 The galley has a custom L-shape as opposed to the straight single counter. 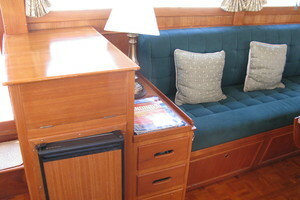 This creates valuable additional counter space. 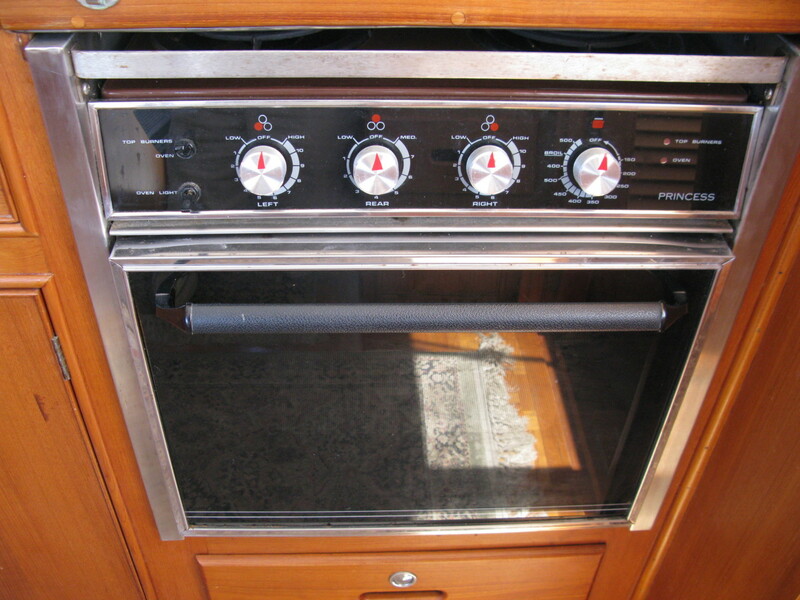 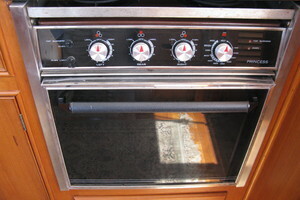 The Kenyon electric stove was refurbished in 2013. 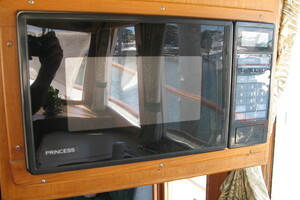 There is a Princess Microwave, and U-Line icemaker. 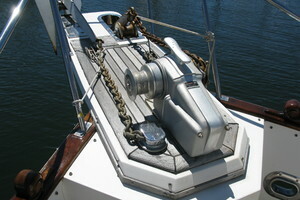 The refrigeration boxes are stainless steel lined and insulated refrigeration box by Grunnert as well as a stainless steel lined and insulated freezer box by with Grunnert holding plates. 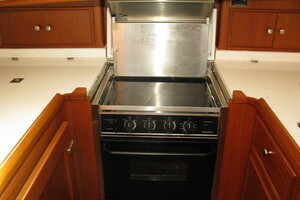 There is a stainless steel sink w/ Brita water filter system. 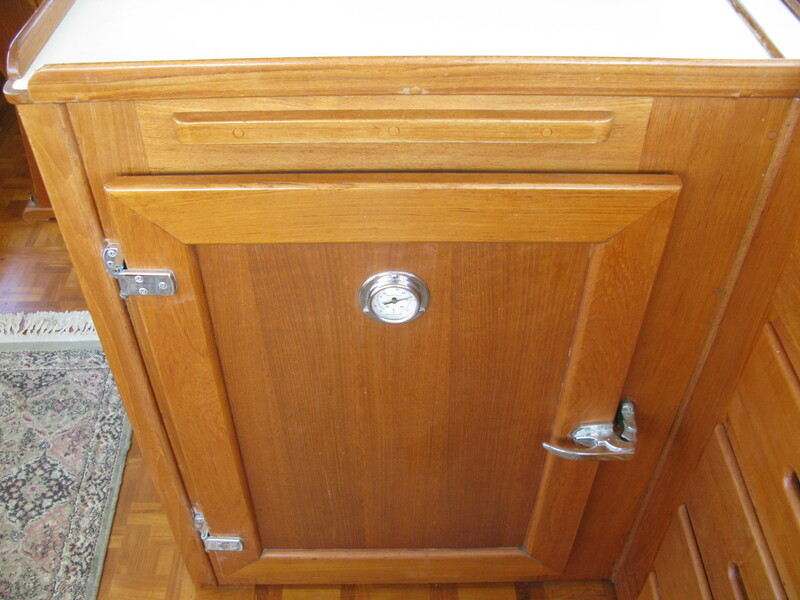 Storage space is more than adequate. 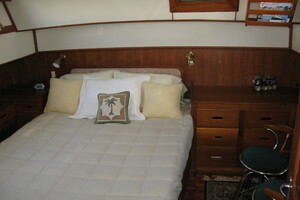 Aft and below three steps is the master stateroom, which is full beam. 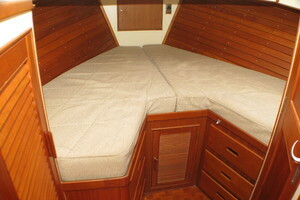 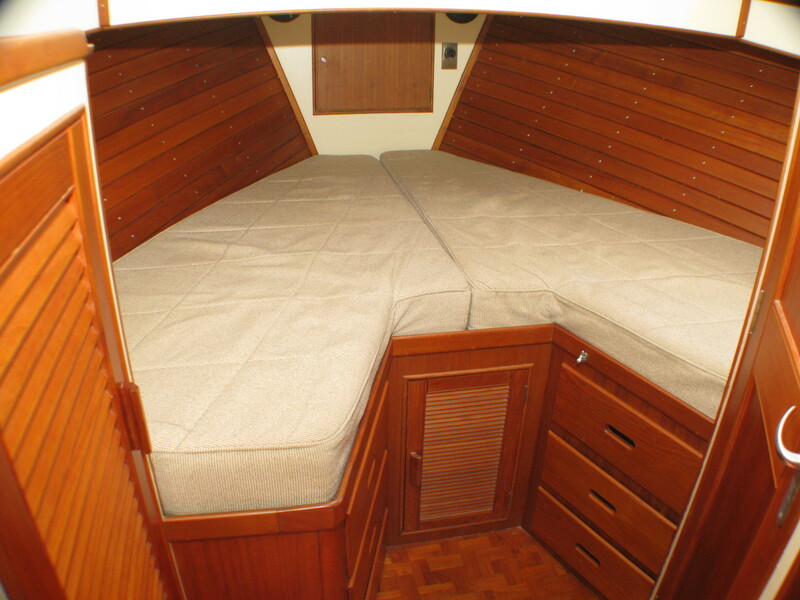 There is a centerline island queen bunk. 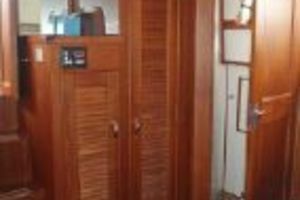 Hanging lockers are cedar lined. 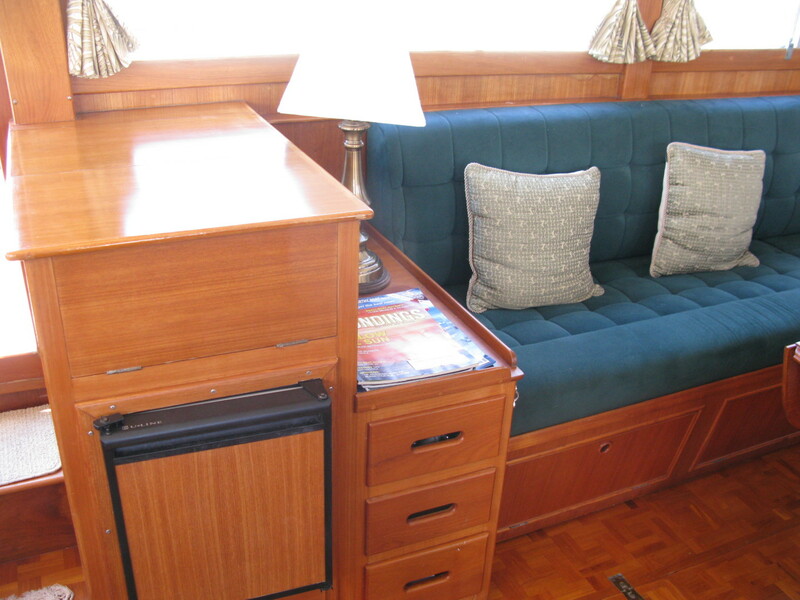 The GB signature aft companionway provides added natural light and ventilation. 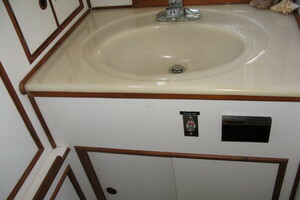 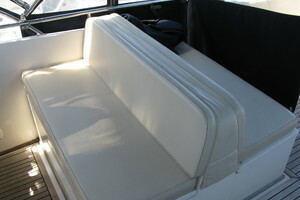 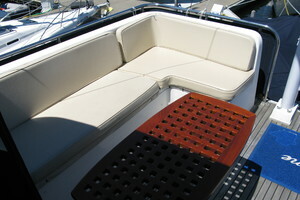 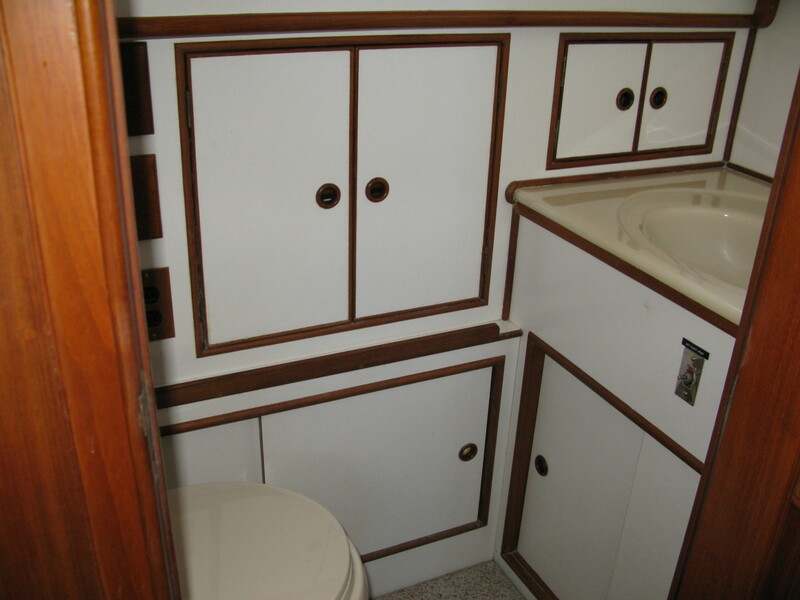 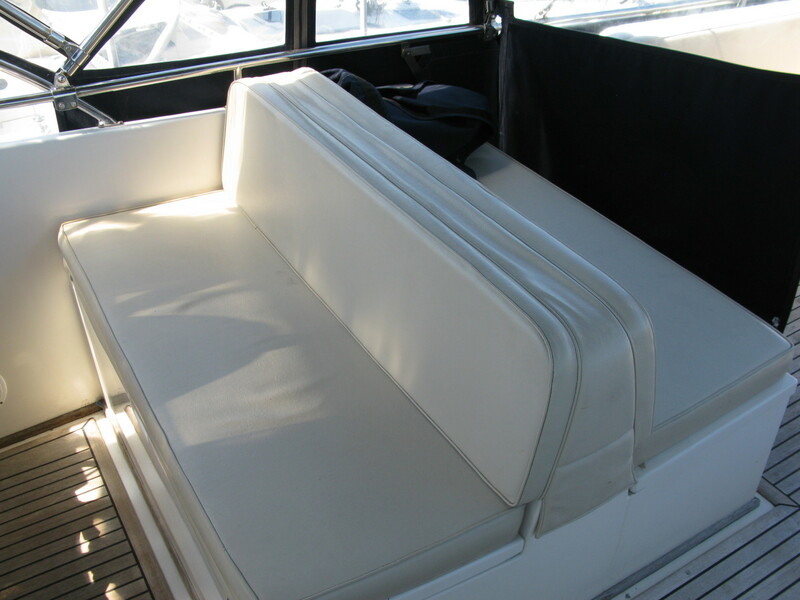 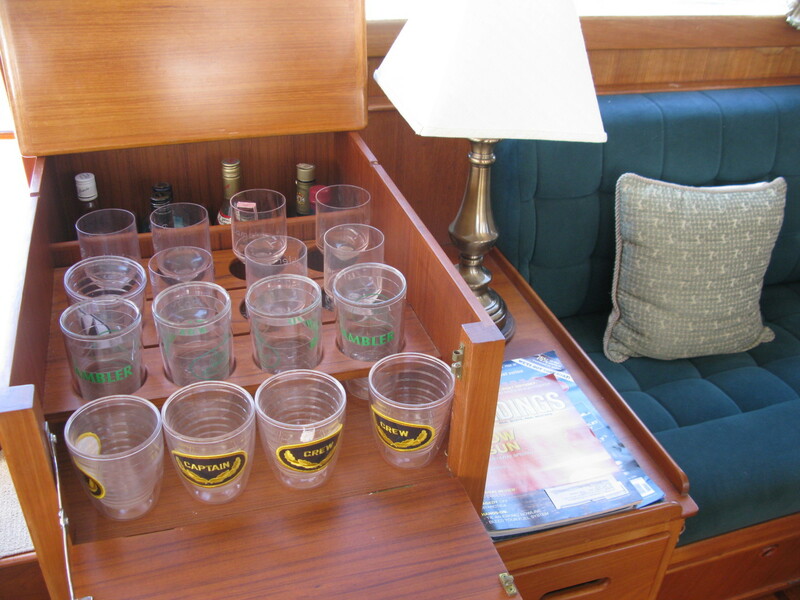 The guest cabin is forward with v-berth and filler cushion. 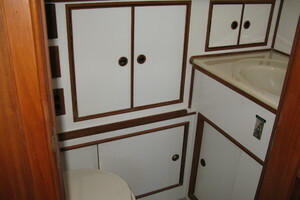 There is a large hanging locker and numerous drawers and lockers. 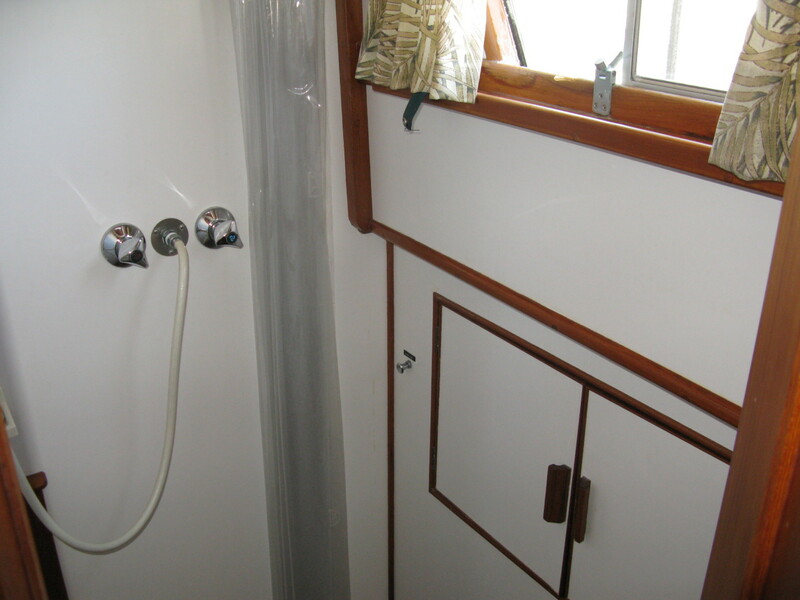 The en-suite head includes shower and Sealand Vacuflush head. 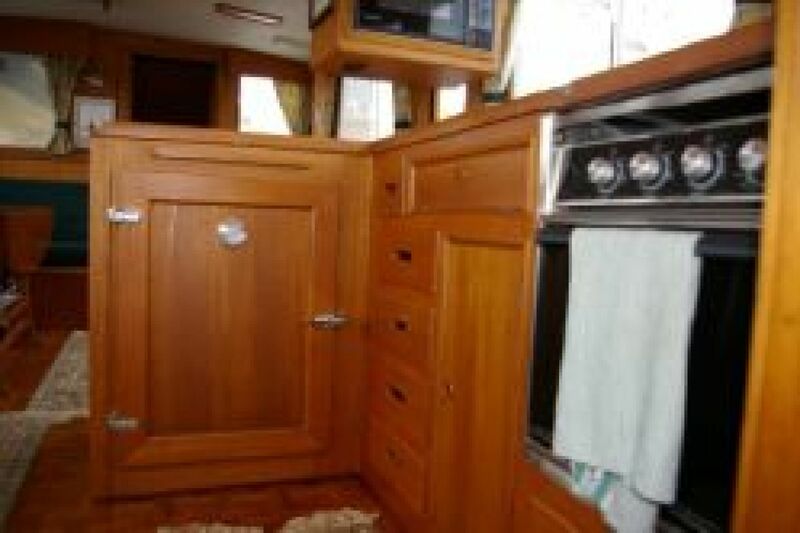 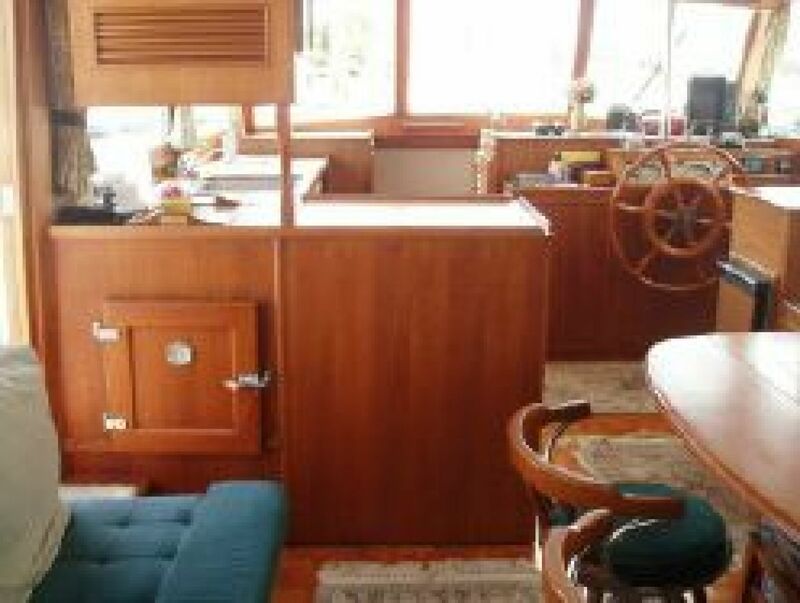 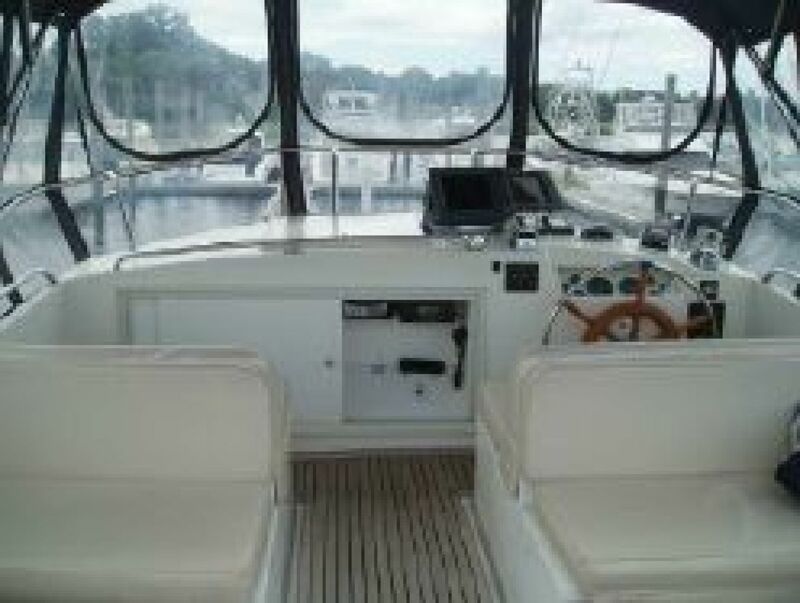 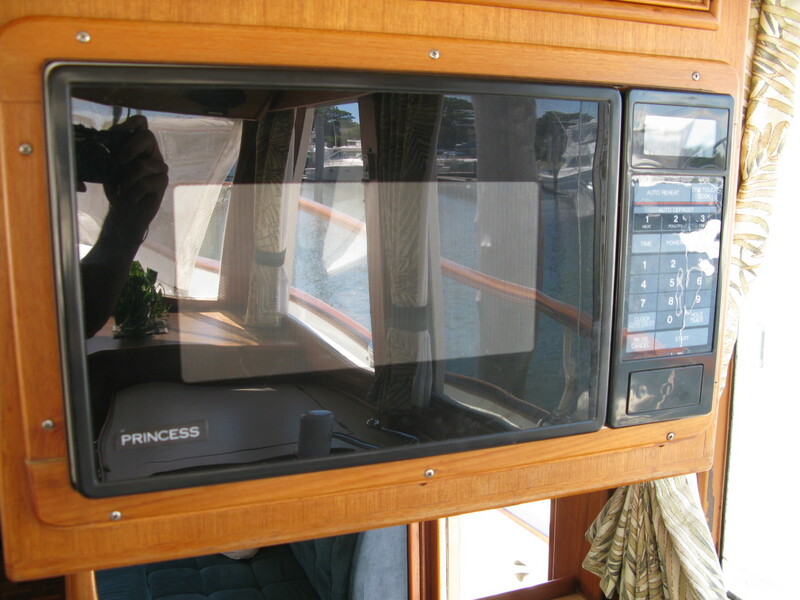 There's a deck hatch with screen and good natural light and ventilation. 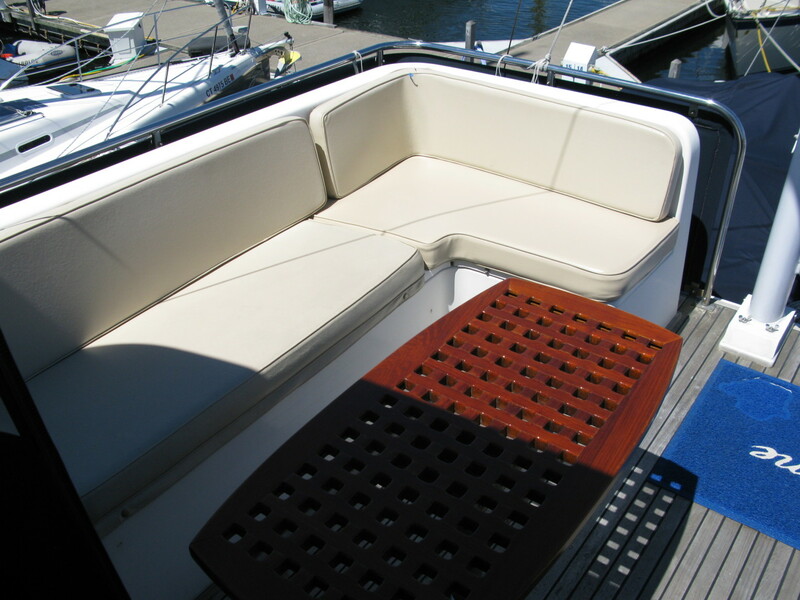 The bridge offers excellent visibility, seating and storage. 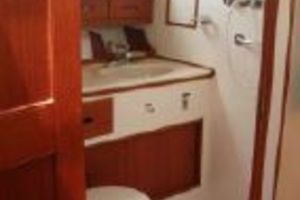 All of the vessels Teak window and door frames were painted 2017. 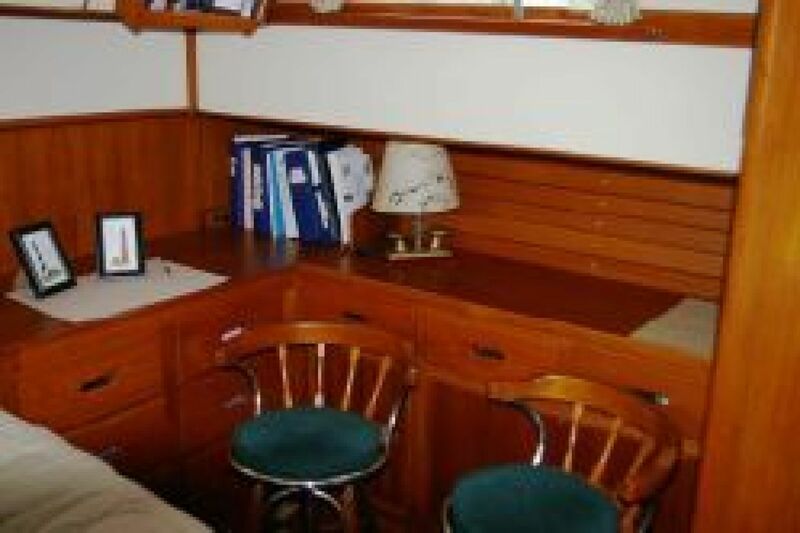 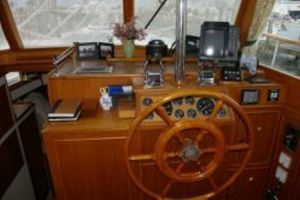 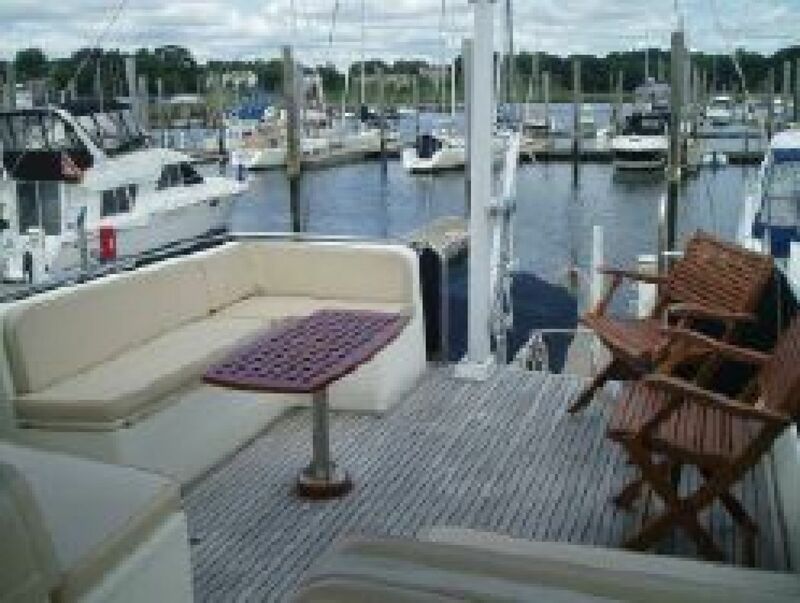 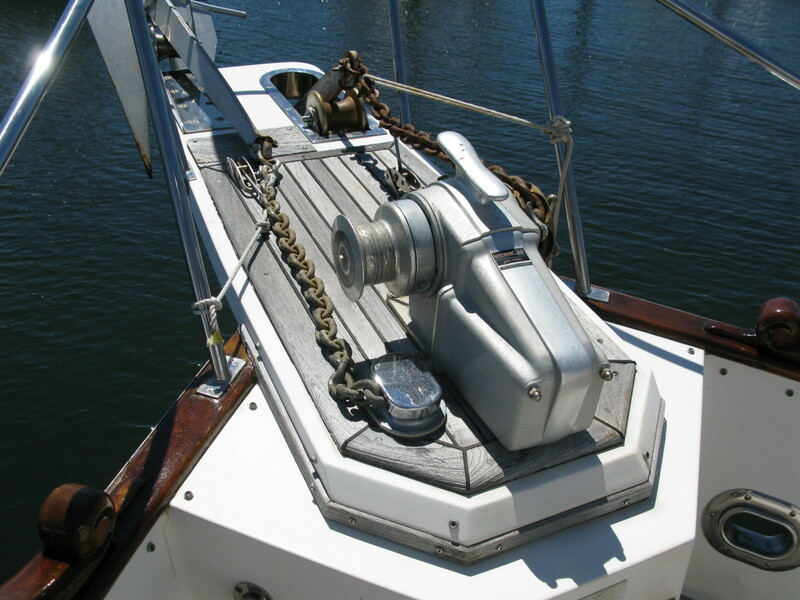 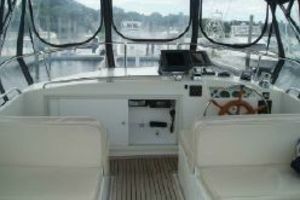 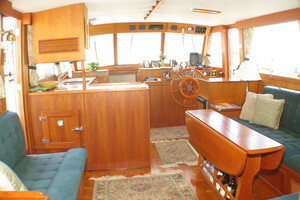 Owner's personal belongings, art work, tools, loose galley items. 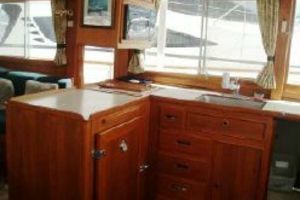 Any item not stated in the listing inventory should be considered excluded.